Jenny joined Sight Concern in 2006 as CEO. 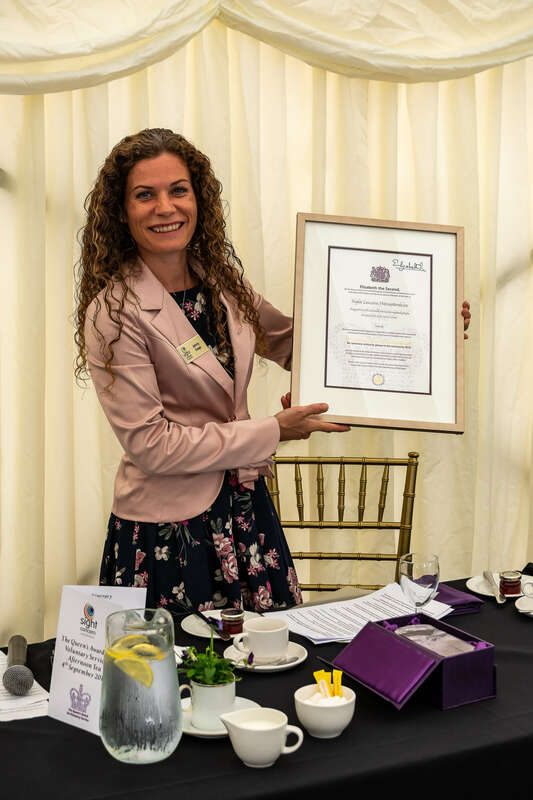 She has a degree in Psychology and has worked for various charities, Housing Associations and Worcestershire County Council, supporting people with different needs including children and adults with learning disabilities, providing domiciliary care and running a young homeless project. As the organisation’s most senior member of staff and she is responsible for the overall administration and financial management of the charity, development and implementation of the long-term strategy, compliance with legal requirements, raising awareness and promoting issues that affect people with sight loss in Worcestershire and for directing its operations in accordance with the policy decisions of the Board of Trustees. She is currently also a trustee of Worcester Snoezelen and a Director of New Outlook Housing Association. She has a real passion for helping people to achieve their goals and ensuring that everyone is treated with dignity and respect. When she’s not in work she’s usually outdoors, hiking up mountains, paddling her kayak or playing hockey. She’s known for accepting almost any challenge, the more adventurous the better. Becky joined Sight Concern in July 2017, she has a background in nursing and also many years spent working for charities managing services supporting people with learning disabilities and mental health issues and also in advocacy. Becky said: “As Operations Manager my role is to ensure that our services are designed and delivered efficiently, and that we have the infrastructure that allows us to reach the greatest number of people who need our support. I also assist our Chief Executive Officer to ensure that we work coherently, and to secure the resources we need to sustain and develop our services and the organisation”. Outside of the work arena Becky enjoys travel and spending time with her family and her cat Monty. Becky has also sung with a choir on the pitch at Wembley Stadium and recorded a CD at Abbey Road Studios in London. Andy joined Sight Concern in 2016. He is a qualified accountant and has a background working in finance, including 7 years’ experience working for a Worcestershire charity. He also currently works part time for a commercial business as a book keeper. He looks after the charity’s finances, monitors income and expenditure and prepares the accounts for the Trustee Board and for auditing purposes. He is originally from Poland and also speaks English, Russian and German. In his spare time, he enjoys riding his bike, listening to music and watching sport. Fiona has two daughters who make her world sing and dance. She has started running in recent years and is training for the 2019 London Marathon. Otherwise, she can be found on her bicycle or in her beloved camper van. Penny joined Sight Concern in 2014. She has been involved with the voluntary sector for over 20 years having worked for ChildLine, Macmillan Cancer Support and the Muscular Dystrophy Campaign. At Sight Concern most of her time is spent organising events and community fundraising. She says, “I’m constantly in awe of the amazing people who take part in our events and the brilliant ideas and energy our supporters bring to the table. I aim to provide all the support and encouragement they need to achieve their targets and aspirations”. Her free time is spent with family, friends and walking Bradley, her border terrier. She is also a member of Worcester Vigornia Rotary Club. Richard has a way with words and leads on our written applications to Grants and Foundations. He has had great results with the Big Lottery Fund, including successful awards from Reaching Communities, Building Connections and Awards for All, as well a range of local and national Trust funders. Outside of work Richard enjoys walking his dogs, playing tennis and crib. 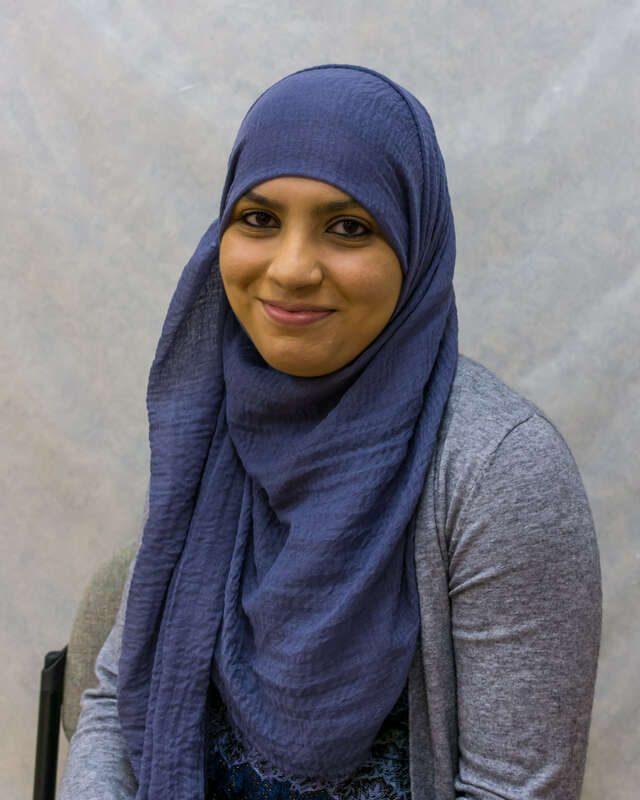 Safina has worked at Sight Concern since 2013 and has had a variety of roles but currently works as the administrator for the Low Vision Service. Previously she worked for another charity. Safina says: “I look after the Low Vision Service which is offered by Sight Concern. Low Vision clinics are held to help people experiencing changes in their vision. A specialised sight test is carried out by a Low Vision Specialist and advice is then provided on suitable magnifiers. In her spare time ….well actually Safina has a 7 year old who keeps her busy so she says that she does not have much spare time! Cat joined Sight Concern in April 2018. She spent the first five years of her career in scientific research and, having rarely been without a voluntary role (or three) in her free time, is enjoying drawing on her experience from both in her work with us. Cat has dabbled in both horseback archery and jousting and says: “I would do that every weekend if I could!” Her dream job in an alternate world would be a stunt horse rider and trainer. Dave joined Sight Concern in 2016 bringing over 20 years’ experience of I.T and customer service experience, mainly in the education sector. Dave’s role is to help the Volunteer Coordinator with general administrative tasks, as well as provide support and encouragement to all volunteers. He processes volunteer applications, enquires about references, carries out DBS checks, performs volunteer reviews, along with many other tasks. Dave has a personal interest in computers and previously worked for Age UK helping older people to learn how to confidently use computers. He is also employed as our Database Administrator and looks after a lot of our social media. He once sang ‘Oh What a Beautiful Morning’, on his own in a stage production whilst at the University of Worcester. He also sang a few other songs during the show…and has never been on stage since! He is an avid freelance photographer outside of his role at Sight Concern. Katy manages the LocalEyes Team of Advice & Support Officers. She is a very experienced member of staff and has worked at Sight Concern since 2009 in various roles. Covering the whole county, it is Katy’s role to support the team providing information, advice and support to clients as well as to be involved in shaping and developing the service. For Katy, being able to support clients to be as independent as they wish to be is hugely rewarding and she is looking forward to being able to continue to do this in the future. 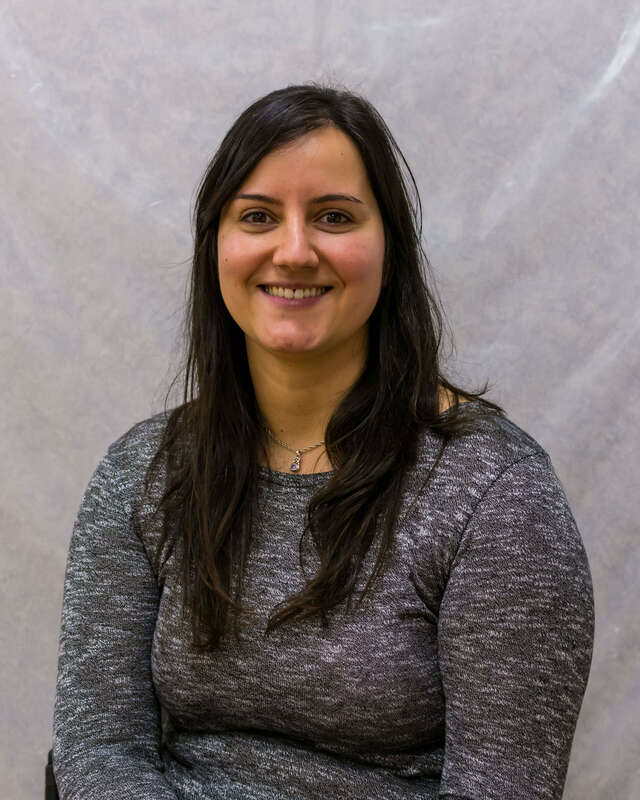 Mafalda lives in Worcester and joined Sight Concern Worcestershire as the Advice and Support Administrator in July 2016 and works full time at The Bradbury Centre. She works in the LocalEyes Team and provides administrative support to the whole team, and also deals with new and existing clients giving out information and support, signposting and registering them as clients. Mafalda has previous experience in the public sector, having worked for the Worcestershire County Council and has extensive experience in administration and customer service and dealing with vulnerable people. Cat lives in Worcester and is a new recruit to our LocalEyes team, having joined us in September 2018 as the Worcester Advice and Support Officer. She has previous experience of working to support people in the charity sector and in Higher Education. Cat has an interest in conditions causing sight loss, having studied this as part of her university degree and is keen to use what she had learned to support people. Please contact Cat if you live in the Worcester area and would like to know more about LocalEyes support. 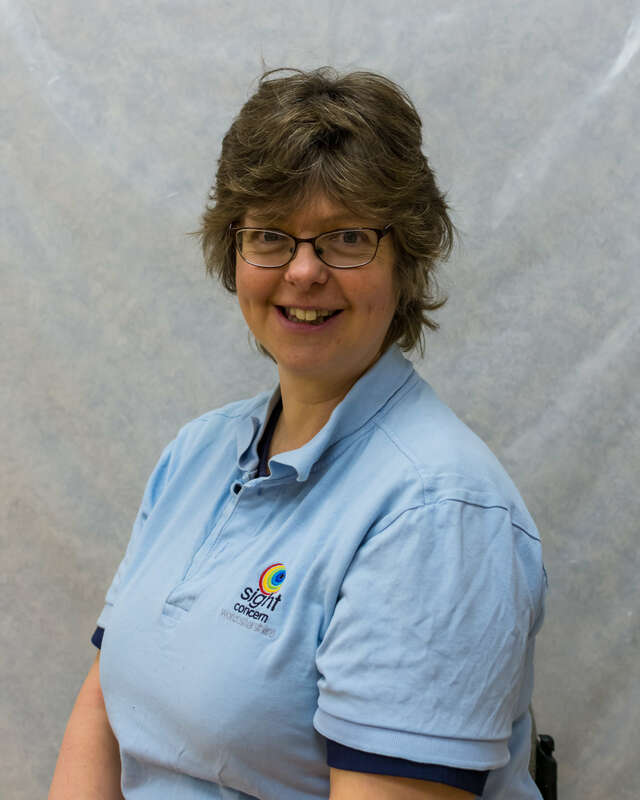 Heather joined Sight Concern Worcestershire in September 2016 as the Advice and Support Officer for Evesham, Pershore and surrounding villages of the Wychavon District. 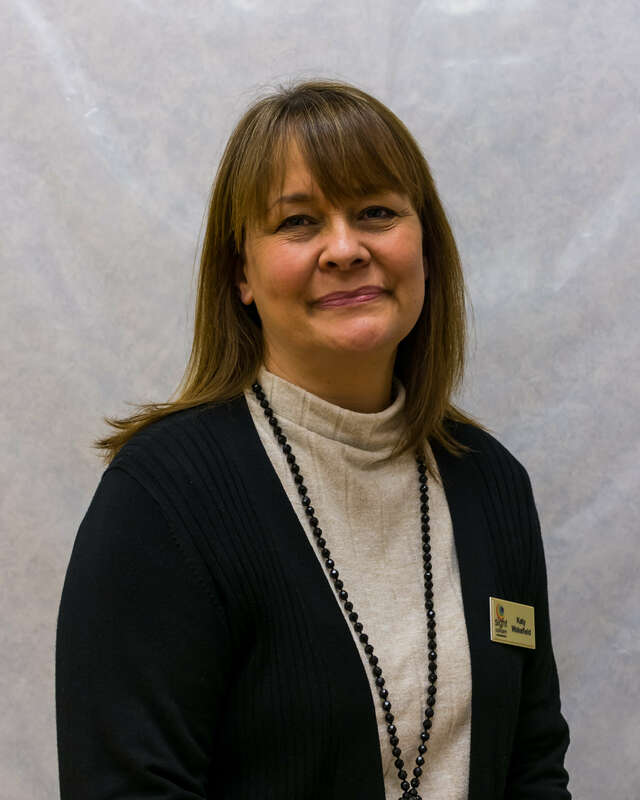 Heather has previous experience in education and training and has worked with a variety of different groups. Please contact Heather if you live in Evesham, Pershore or the surrounding area and would like to know more about LocalEyes support. Helen has been working as an Advice and Support Officer for Sight Concern Worcestershire since August 2012 and has a background in teaching psychology and counselling. Helen says, “I have been helping and supporting people in one way or another all my life. I am there to help with any queries and put people in touch with other organisations who offer specialist services in different areas of their lives”. 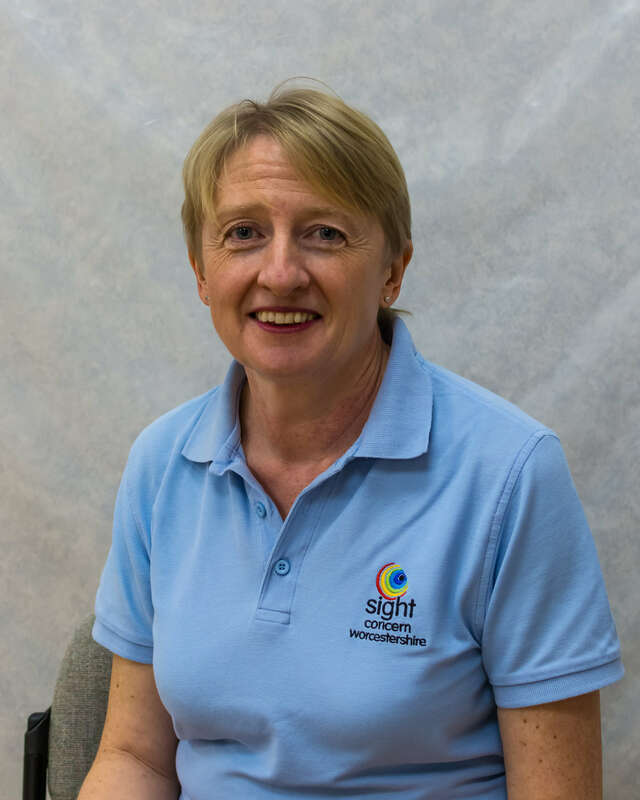 Helen works Monday, Tuesday and Thursday and can be contacted on either 01905 723245 or 07804 027597 or by email to h.beardes@sightconcern.co.uk. Please contact Helen if you live in the Bromsgrove area and would like to know more about LocalEyes Support. Jenny lives in the Malvern area and has been working at Sight Concern Worcestershire since November 2015 as the Malvern Advice and Support Officer. Jenny has a background in social work in both the statutory and voluntary sectors and has invaluable experience gained by supporting those affected by sight loss in the local Malvern area. Jenny says, “We reach out to people in the Malvern area who might be struggling with their sight. I can advise on all sorts of practical and emotional issues such as what equipment might be beneficial and which other support groups are around. I also give information on specific eye conditions and can generally be a signposting and support service. Whether you’re struggling yourself or you know someone who is, please do come along and talk to me”. Jenny also attends the traditional Malvern Branch meeting which takes place once per month. Please contact Jenny if you live in the Malvern area and would like to know more about the LocalEyes Support. Michelle has been working as an Advice and Support Officer for Sight Concern in Redditch and the surrounding area since November 2015. She previously facilitated support groups for a behavioural change project in Birmingham and has worked with referred clients to improve their medical conditions via prescribed activity, so she has a wealth of experience in supporting and advising people. Please contact Michelle if you live in the Redditch area and would like to know more about LocalEyes Support. Sandra joined Sight Concern Worcestershire as the Wyre Forest Advice and Support Officer in December 2016. 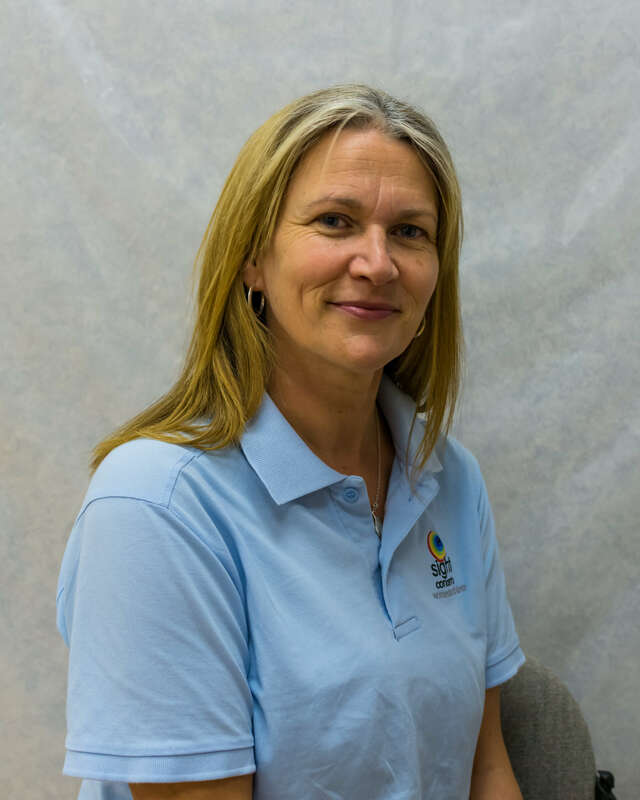 Sandra has previous experience in the voluntary sector working with people with acquired brain injury/brain tumour within support groups and supporting clients one to one. This included clients with sight loss, giving her invaluable experience. 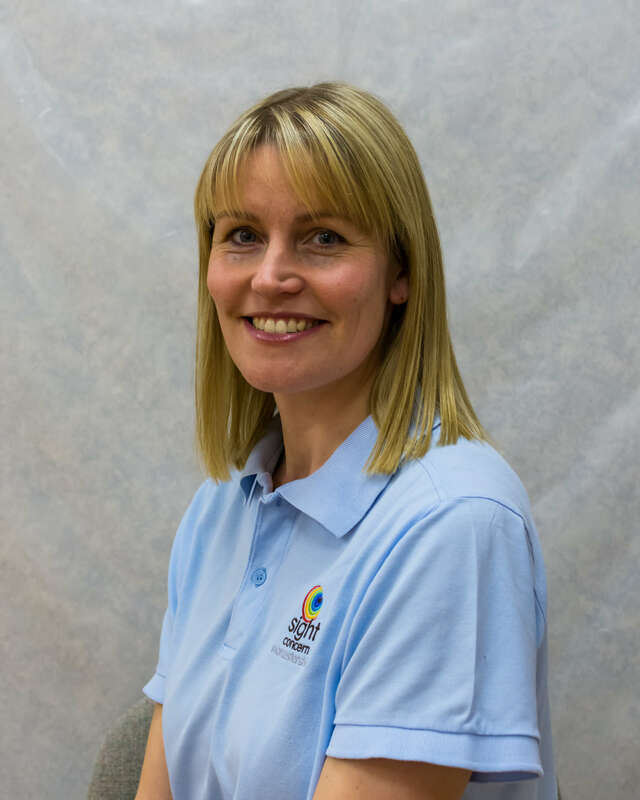 Sandra says “As part of the LocalEyes Team, I support clients at a range of activities in the Wyre Forest area. I can advise and support clients on a one to one basis with a range of emotional and practical issues such as what equipment they may benefit from, finding new ways of doing things, and which other support groups and services are in the area. I can give information on specific eye conditions and signpost people. I also support clients at our traditional branch meeting in Kidderminster, which takes place once a month”. Please contact Sandra if you live in the Wyre Forest area and would like to know more about LocalEyes Support.